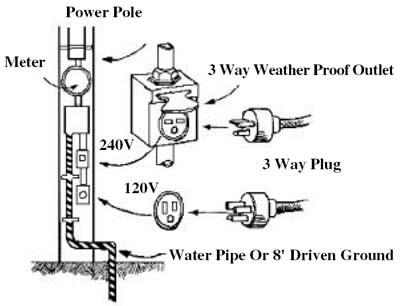 Grounding Electricity - VSI Home Inspections, Inspected Once, Inspected Right! The combination of voltage, amperage, resistance to the flow of the current and duration of contact makes working with electricity dangerous. Electricity follows an uninterrupted path. If the body becomes part of the path, electricity will pass through it. Even though dry hands and feet offer more resistance to electrical current than do wet hands or feet, the current can be lethal under either condition. This is especially true if the electricity passes through vital organs, such as the heart or lungs. Electricity always follows the path of the least resistance. Grounding electricity means that there is an easy path for the current to follow. Have only a qualified electrician perform electrical repairs. Moisture and electricity never mix. Unplug tools immediately after use. Do not use water to put out an electrical fire. Make sure that electrical power tools have a true ground or are double-insulated. For example a drill has a third wire which is the ground wire. This means that the current will follow the ground wire-not the operator. If a drill develops a short, have it repaired before using it again. Check that portable electric hand tools are properly grounded or use an acceptable double-insulated electric power tool. Usually a three-prong plug in a three-hole outlet provides a proper ground. GFCI was designed specifically for people safety. It can be hard-wired into an electrical box, or it can be portable so it can be plugged into any electrical outlet. Should there be an imbalance of electrical current, due to an electrical short, it would activate the GFCI and prevent an electrocution. Electricity always follows the path of least resistance. Only electricians should make electrical repairs.